Police: Stop and search ...another post. The METS figures on knife crime in recent weeks are clearly horrendous. Daily we are informed of the latest death or serious injury on London's streets. The media are in a frenzy, politicians demand action, family's want answers and results. Stepping back from the figures the background to this seems clear. There has been a massive drop in stop and search by the Met over recent years. This in short has been led by a significant interference by politicians and other vocal interest groups in the use of stop and search and its perceived overuse on sections of London's communities. The political and media 'furore in days gone by has left the majority of officers stepping back and saying to themselves ....hands in pockets?...it's not worth it. There was certainly never any overt pushing back on this by our upper echelons on the issue. Officers felt isolated and understandably backed off themselves.Politicians talked of discipline for 'incorrect use ' of stop/search. Constable Keith Palmer paid the ultimate price for doing his job yesterday at the Palace of Westminster. Unarmed, he was fatally wounded as he confronted the crazed maniac who had caused senseless carnage on the bridge moments before. I was one of the many officers despatched to assorted parts of the Metropolis as the event unfolded. My team were constantly checking for updates on our mobiles until, sadly, confirmation came through of his death. I was watching Prime Minister Questions today and her speech to the House and the assorted back and forth as MPS from both sides tried to catch the Speakers eye. Much, and rightly so, was talk of the bravery of Keith Palmer and the police and emergency services in its aftermath.The event was clearly very close to home for those who work at the Commons. In typical MET HR speak it goes on ' We see healthy churn as a positive, creating space to recruit new capabilities which would take many years to develop internally'. It also talks of officers leaving being able to join a new 'formal reservist capability' which will be developed internally. I've lamented in my previous posts about the way the METS going and this is just another confirmation of it. The determination of the IPCC to nail a police firearms officer continues unabated. I can understand the concept of a referral. A male has been shot and has died and a police officer fired the shot. However the use of the words 'an indication' a criminal offence has been committed' is somewhat vague. As a police officer I would be given short shrift if I submitted a file to the CPS stating there was an 'indication ' an offence was committed. They want a WHOLE lot more than that. Reading into this it seems the IPCC want to pass the buck upstairs to the CPS and not make a decision themselves. Police: I was sitting there ...! 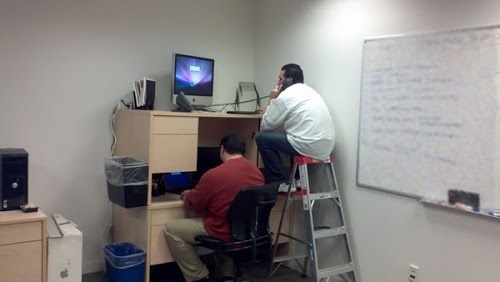 As the MET tries to cram more and more people into fewer and fewer buildings its 'Hot Desking' concept leads to desperate measures . A DIAMOND group has been formed in the upper reaches of the MET. I am not sure where they get the names. Clearly the old BRONZE, SILVER , GOLD is so last year. One of its aims is to explore the possibilities of bumping up the Detective ranks ( of which the MET is severely short ) by using Specials and pushing new entrants straight through to DC pathways without, it would seem, the implied inconvenience of spending a couple of years learning the basics in a uniform role.Frankly I am not surprised that senior management think this is workable. There is much discussion in other police forums as to how desperate this idea is and I wont waste any more columns adding my 10 pence worth to it. I then read we have an entity called MET Enterprises ( a nice consultancy fee somewhere coming up with this baby!) which aims to explore and utilise the MET brand. One of its aims is to sell the MET's worldwide reputation and in particular its world class training. At around this point I had to stop and think WTF! Police: What do you expectorate? I was reading the Evening standard on the commute home last week and saw a small article saying the Met had decide to trial the so called spit hoods on a selection of Boroughs. The discussion on use of spit hoods has been bouncing around the Met, off and on, for years. As expected the SLT at the higher levels huffed and puffed. Anecdotally its rumoured one of the SLT asked if we were expected to wear the hoods!!!! Any way it came as no surprise that the usual suspects came out bleating with weapons grade handwringing angst. So is being gobbed on. Frankly it came as NOOOOO! surprise there was a U turn as our new mayor and MOPAC threw the usual politics into this and our Management ( sorry.... Leadership) rolled over as only they can. I was reading the Evening standard on the commute home last week and saw a small article saying the Met had decide to trial to so called spit hoods on a selection of Boroughs. The discussion on use of spit hoods has been bouncing around the Met, off and on, for years. As expected the SLT at the higher levels huffed and puffed. Anecdotally its rumoured one of the SLT asked if we ere expected to wear the hoods!!!! The Police Federation of England and Wales have started to E mail its members. I hadn't heard from our hardy band of firebrand representatives for some time. I did check my pay slip .They are still taking my subs so I assumed they still existed.This flurry of activity is no doubt due to the recent Federation jolly at Bournemouth in which the Fed Reps at assorted levels assemble on Fed expenses and as the highlight for a few days by the sea invite the Home secretary to attend and generously give her a platform for a speech which basically rubs their noses in it....again.